The CoffeeShop Blog: I Finally Made Tasty Biscuits!!! I Finally Made Tasty Biscuits!!! I have been on a quest to make delicious biscuits. Honestly, I feel guilty serving my kids those canned ones, especially since I love to bake. However, until today I have not been successful. I don't like using shortening and that really limits the recipes out there. Every recipe I have tried has resulted in hard, short hockey pucks. But today I finally found a winner. 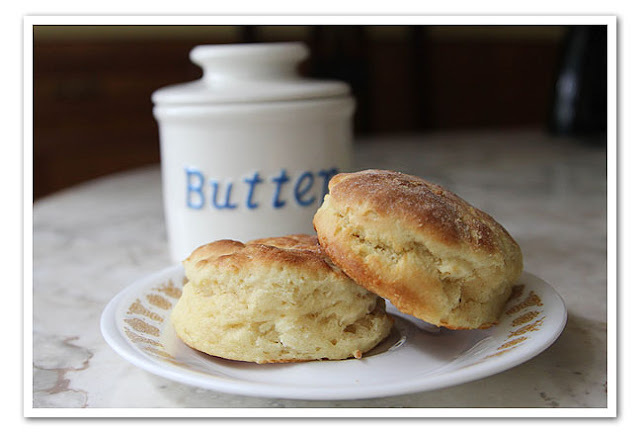 These Southern Buttermilk Biscuits are delicious and are made of butter instead of shortening! I didn't have buttermilk on hand so I added 1 tbsp of white vinegar to a cup of milk and let it sit for five minutes. I also found the biscuits a bit too salty, so next time I will lower the salt by 50% or so. But these biscuits turned out fluffy, buttery and soft. In other words, heavenly. And I was able to use my food processor. You can see my little L Tremain Butter Bell behind the biscuits. My mom gave this to me on my birthday and I absolutely love it. We have been trying to eat more "natural" dairy like whole milk and butter, but I hate spreading hard cold butter on my pancakes. So I just add a stick of butter to my butter ball and I can keep it at room temperature for a week or so. I just change out the water every 2 or 3 days. So far the butter has stayed fresh, even through this hot Texas summer. Fresh biscuits and real butter. Hungry yet? I found this post funny, because here, we LOVE the canned biscuits! They're really rare treats around here. :-D Congratulations though! I just "Pinned" your biscuits! I simply LOATHE canned biscuits. I have had success with homemade biscuits, but only using shortening. Looking forward to trying these! Thanks so much for sharing! Thank you for this! I would prefer to make homemade biscuits for special occasions and weekend breakfasts, but I've never been able to make great ones. I'll try this recipe. I think the butter will make all the difference. Thanks again! I always use milk with lemonjuice instead of buttermilk. Called scones in NZ too, and we never use shortening. A fail safe recipe used here are "Lemonade Scones" (We called Sprite/7Up lemonade) Light,tasty & very fast to bake. The biscuits look great. :) But I'm super excited about the crock you showed! We, too, switched over to real butter (organic from pasture-raised cows - so yummy!). It tastes sooo good, but I hate spreading it on things because it's hard out of the fridge! I think I'm going to put your crock on my Christmas list. :) Thanks for sharing! They look delicious!!! I have made biscuits from scratch like twice; they are so good that way!! I like the recipe from Anonymous in New Zealand. We make them (scones) the same but leave out the sugar (lemonade has enough sugar already!) And we spread with strawberry jam and fresh thick cream to eat. Delicious!! Only thing is I don't know if you guys in America have "Self Raising" flour. You would probably just have to add some raising agent (baking powder?) to your flour.